I'm not the one making excuses for not making power. I'll check fiero warehouse, thank you for the sugestion! I'm not making excuses. I'm making dyno proven facts. Saying an iron head motor can't make 250rwhp is not only bench racing, but pure BS. As I've said before, I'm not going to spend money changing wheels to prove what is proven just because some troll doesn't accept reality. However, as I'm a consultant, if you pay me to do so - I will, Will. Plastic of course! That's why I'm going to cut the inner lip along the Firebird fender and cut most of the Fiero fender off leaving an inch on top and essentially glueing it to what's left of the Fiero fender where it mounts to the frame. My Fiero fenders are cracked from turning the wheels too far so no big loss there. Hmmm!! I like the look of a Firebird nose also. I'll look in to it. The other thing is that I want to do it so I can remove the front clip. Hey Lou! Where can I get a set of fenders like that and the nose? Have you driven it much with the welded diff? I'm curious about how that'll affect the handling. Do you have the car set up very stiff, to mimic a kart with no suspension? Thats probably the thing I'm most excited to see in this build. I have driven it plenty and the one thing I love about having the welded diff is the amount of grip that the rear obtained. The car had a tendency to oversteer easy after I added the fiero store rear swaybar with the open diff. 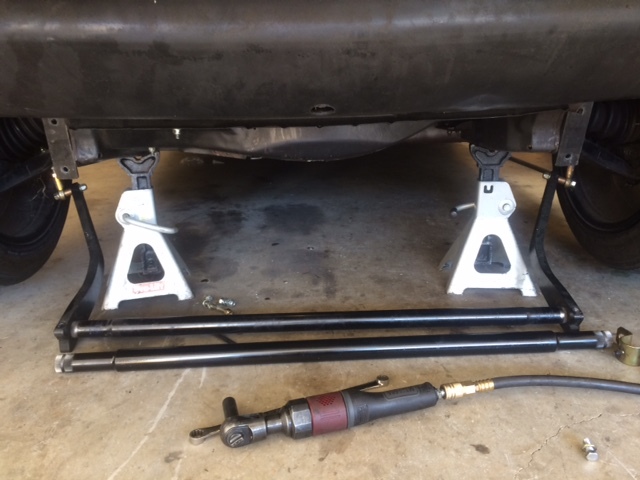 I then upgraded the swaybars with adjustable NASCAR style fully adjustable and 350# springs and I was able to adjust the car better but I couldn't get the predictability I was looking for. After I welded the diff high speed braking improved a lot and I can throttle steer it in a very predictable way. I feel more comfortable driving it with the welded diff than without it, I would never go back to an open diff. A lot of F-body guys in my area always buying them and stripping them for parts so I got my set cheap. You can just go to a pick and pull. 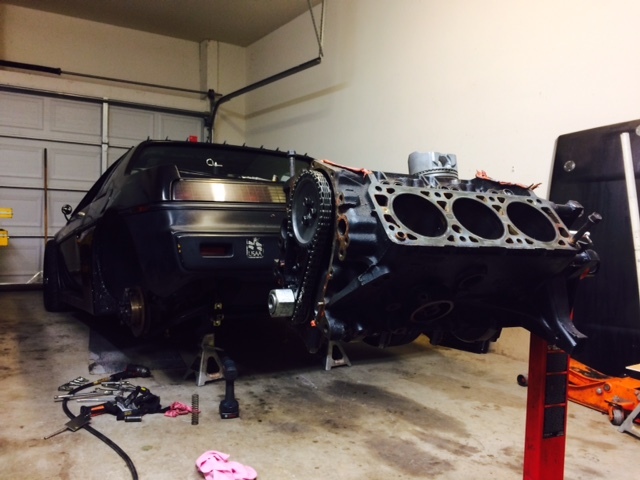 It all unscrews off like the Fiero panels. Make sure you grab the lighting connectors if you plan on wiring in the lights. How do you think it compares to say, the same car with an LSD? I know you cant get an LSD for those transmissions, but lets talk theoretically. Everyone Ive talked to about it thinks that with the welded diff it'll just understeer or snap oversteer unless you go fast enough to lift the inside rear like on a kart. That makes sense to me, too. Is that what you're doing? Or is the understeer and oversteer a non issue? Also, how stiff is the front setup compared to the rear? Well, from an experienced Porsche and kart driver I will tell you that is just perfect. Now, if someone is doing these mods to their Fiearo with no driver experience, he or she will be very disappointed because they are lacking the experience. The rear grip increase is due to the lack of front turn in grip but as soon as you apply throttle the understeer disappears. You literately drive the Fiero with the throttle and to do that it takes some experience. WIth practice and patience anybody can do it and once you experience that, you'll never go back to your old stock settings. Boot, I can fine tune how I want the car to behave at a specific track. The front has the same set up. 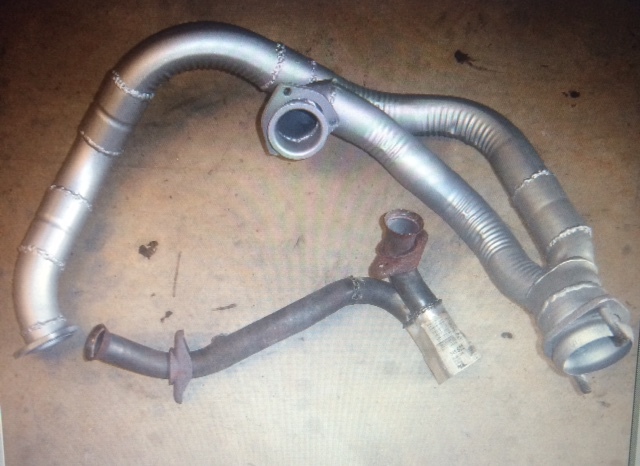 I can change the swaybar thickness front and rear and can also can interchange front and rear bars. They have the same spline. It's very tuner friendly! 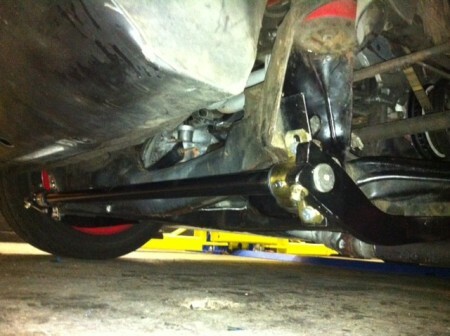 Now THAT is a sway bar! Right now it has a 38mm rear bar and a 29mm up front. In a regular Fiero set up the bars order would be the opposite, but having the welded diff the bigger rear and smaller front bar complements the extra grip provided by the welded diff. I can throttle steer it easy and I have complete control of the drift at mid and slow speeds. At hi speed, well; I'll try that this weekend at the track. When I said my Fiero handles like my kart, believe me ; it does! Oh, ok. You have low offset wheels rather than ridiculously wide tires. Well guys, I couldn't make it to the track this weekend. I took the car to the dyno friday morning to simulate a couple of laps on it, that way I can concentrate on the driving instead of tuning the car. Just to make sure that the fuel and ignition maps are good. 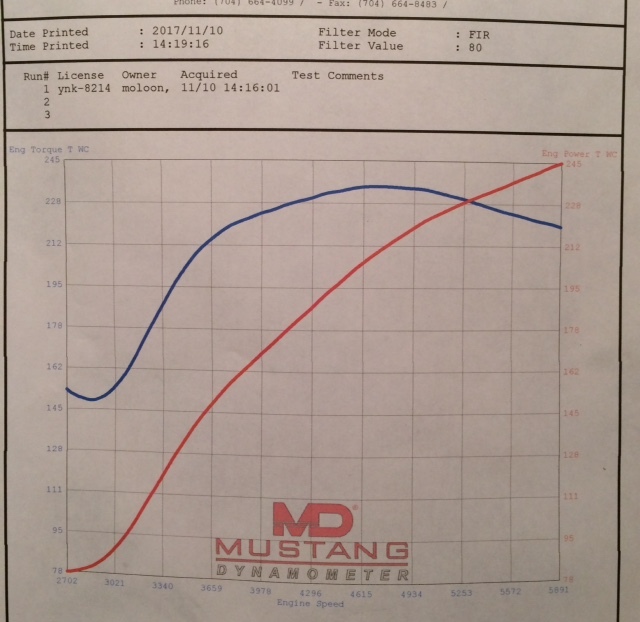 I did some tuning at the mid range to fix the big dip that the previous dyno sheet shows. It did fantastic! I picked up 50 lbs/ft of torque and 13hp at 2800rpm. The simulation went very well, I was not tuning for ultimate hp but the owner of the dyno told me that I broke into the 250WHP in the 1st try, so I was excited. My main goal was that the engine responded well at all RPMS, so I concentrated on that, so I ran on the dyno for 30 minutes as hard as I could, playing in my mind the roadcourse and accelerating and decelerating accordingly, no problems at all! At 4:00pm friday and I haven't got my hood and decklid back from the bodyshop! I bring the car back home and suddenly I see a spot of oil on the floor! The driver side driveshaft seal is leaking! No big deal, I raised the back end to inspected. There is some rotational play between the rear wheels!! I took the speed sensor off and drained the trans oil to inspect it with my bore scope and I can see some welds on the spider gears missing!!!! 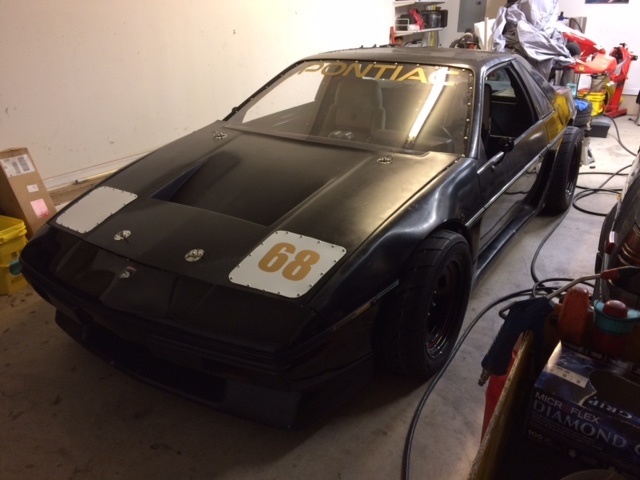 The hood and decklid showed up, also my friend with the trailer to take my car to the track showed up. But my gut feeling told me not to go and I just went with my gut. I also checked the play on the axles and they are sooo worned out!! The car drives fine, both rear wheels are still locked. I have to do a cradle change and some upgrades on the engine, I'll just wait until I get my new cradle and engine upgrade to fix the diff. I think I got a print of one of the passes while on the dyno, I'll try to find it and post it. Too bad, was looking forward to some in car vid. Good luck with the fixes. The driver side driveshaft seal is leaking! I was wondering if you were going to have durability issues in that regard. 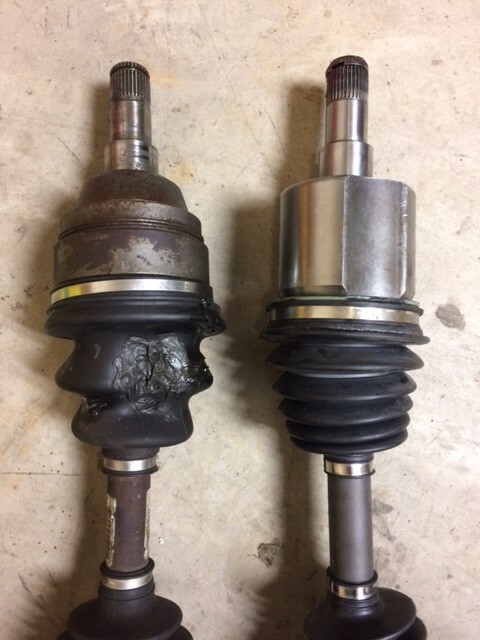 The GM FWD axle form factor is not suited to the abuse of driving with locked diff and a lot of traction. The inner CV joint splines in the transmission are the second weak point in the axles... following the outer CV joint splines in the wheel hubs. Yes Will, these axles are the ones that came with the car when I bought it since 2008, so you can imagine the abuse they've had over the years. I'm going to re-weld the diff and save some money. The Driveshaft Shop is near my town and they make axles for the Fiero, at only $700 pair. Is there an upgrade I can use as an less expensive alternative? Interesting... they claim to be able to make any configuration. I wonder if they use bespoke inner CV joint tri-pots or what. The configuration pictured uses an intermediate shaft, or maybe is for a 4T65E-HD trans, but if they can make the Fiero configuration, that would work. Stock, the CV joint stub will shear before the splines strip out of the side gears, but I imagine that situation is reversed with the DSS axles. I have a pair of the old Ecotec racing program axle flanges for 94mm bolt-on CV joints... A few sets are still available for $550ish, but you also need to run them with an intermediate shaft and custom axles, which bumps costs up a lot more than just running DSS axles. This is one of the runs I did that day. It only shows power to 5891rpm but at you can see the line is a straight line. I had the runs up to 6000rpm because I was concentrating on smoothing out that dip at lower rpms. This one specifically shows 245whp @ 5891. Today I'm tuning for the upgraded pump and injector and at low to mid rpm 1/4 to 1/2 throttle the car is wicked torky! And in the 3rd low to mid take off test and it had no problem lighting off the new soft Toyos then this happens! All I did was laught!! The funny thing is that I picked 2 new axles earlier today because I'm going next weekend to the track! A little off subject but here's my first fiat, Mine was red. I think that's the first time I've seen a 3.4 V6 snap an axle. Getting new axles and wheels bearings! No fins, they are for low to mid range improvement. This build is from mid to top. I wanted to suggest another brand of clutch that I haven't had any issues with and it grips great as heck!...local for me in SoCal.. http://www.clutchmasters.com/fiero/ ... I'm actually running a FX350 but I don't see it on their website under our car search. I'm sure they still have it available though. Simple call.. I managed to get a 9-11/16" pressure plate instead of the stock 9-1/8" but I know it's not available anymore through them.. I forget what the compound the clutch is but it doesn't chatter what so ever and is smooth in the shifting.. I need to mention that I have new cables from Rodney dickman and a short throw shifter... my flywheel is the stock 88 but has been decked some to shave the weight.. also 13.4 lbs but I want to stick with the billet steel.. resurfacing by Clutch Masters.. along with replacing the teeth due to 2 broken ones. Also... I'm curious... aren't your side panel scoops functional?.. the reason I ask is that I have modded side scoops (both sides of the car) and I mounted a B&M oil cooler with a temperature controlled fan sitting on the passenger side under the battery box in the well area. 8x8 x1-1/2 with fan inches deep, I think. 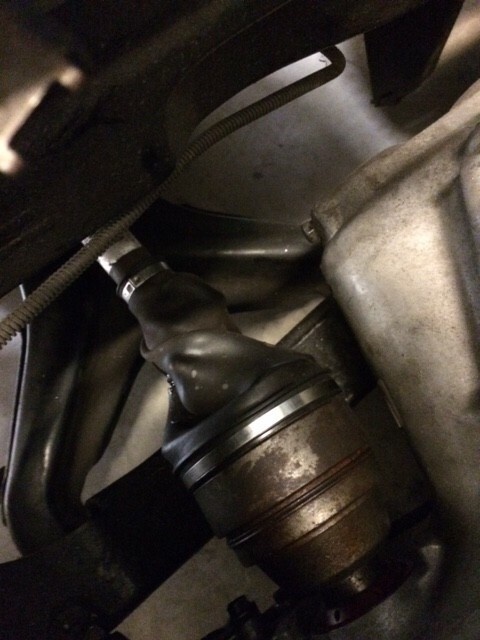 fit like a glove with some little space left over.. the oil filter may fit as well... it works so well!.. why the trunk?.. I had to fab a bracket but no big deal.. Thanks for the clutch recomendation, they look pretty good. Right now when I flatshift at 5500rpm the clutch I can feel it slip. Taking off and shifting without flatshft is fine but when the flatshift is engaged and I shift thats when it slips, no smells or anything. I'll get me one of those, thank you very much again! The fin is there to divert air around the valve stem, there's also a cavity above the fin so some air gets diverted down to near side while side air goes around. When switching to Fiero Store, SI valves, the stem narrows on the combustion end to the narrower diameter of the GEN3 valve stems. The fin can be narrowed a bit as well. 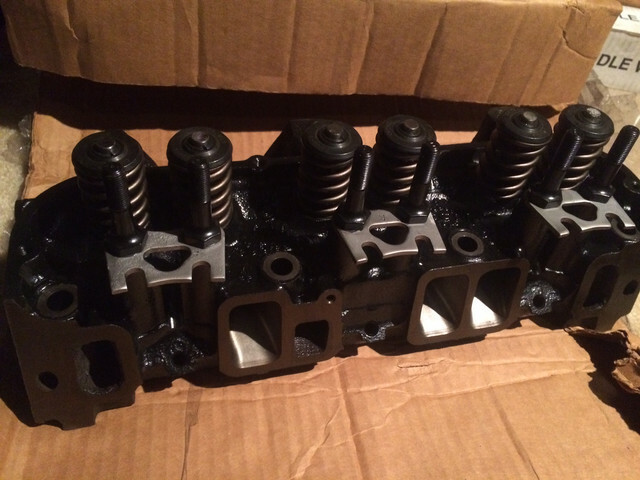 With the right guides, the 1.76" intake valve can be used and the opening radiused larger for a bump in compression and flow. This trypods look better than the stock ones. Hopefully this can last a little longer. New axles and bearings are in, tomorrow I'll torque the hub bearing nuts. I'm beat up! What application are those axles from? You're running the Muncie 4 speed for the V6 with 4.10 gears? I'm modifying the trunk with an air vent and the oil cooler will have a fan drawing air through it.